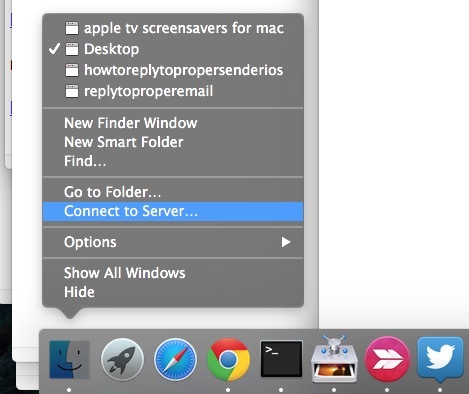 From here you can connect to FTP, SMB, VNC, local, or remote servers as usual – and yes they will open in the Finder, or their respective application. 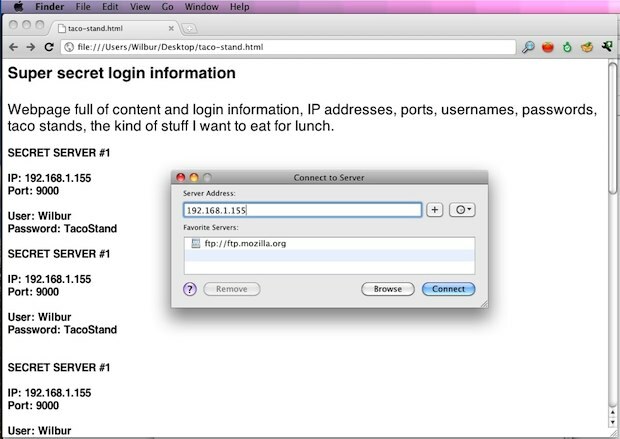 As you can see in that screenshot, the Connect window hovers over the web browser, despite being in the Finder. This is far better than using Command+Tab or clicking through to the Finder if you have a bunch of Finder windows open, since they will all cover the browser window. 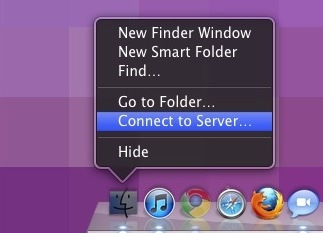 This works in all versions of OS X, by the way. If there are servers that you access frequently, mapping them as a network drive can be helpful so they auto-mount each time you login or reboot your Mac. This is particularly useful for media center servers and drives where sharing files is common. Nice use of Command+K, never thought of that. It would have been nice if you had chosen to demonstrate this with secure notes in a keychain shown in the background, or at least a text file stored in a secure disk image, rather than with a plain text file on your Desktop containing login information. That kind of gives the impression that that’s an okay way to handle these things, which it very much is not. You just make aliases of the servers to which you generally connect and put them on your desktop (or everywhere you want). So, with a simple double click, you can access directly to the servers. Must be my age; surely not my 25 years with Apple. And Tweeter brevity must be taking over the world because I can’t get anything (‘cept getting to server from dock) from this incomplete and unclear article. Good writing reaches all audiences.